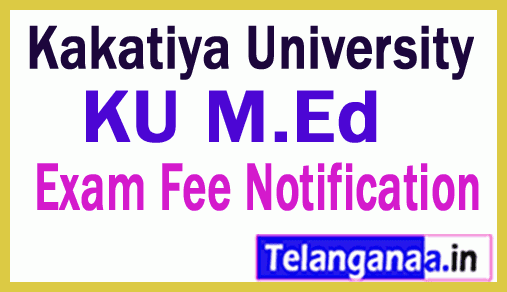 Kakatiya University M.Ed 2nd Year 1st Sem Reg / Ex-Students Exam Fee Notification 2019: Kakatiya University (KU) has published M.Ed 2nd Year 1st Sem Exam fee 2019 @ www.kakatiya.ac.in .Large number of candidates are puirsuing M.Ed II year 1st Semester are looking for the examination fee Notifictaion. Those who need students of Kakatiya University can make a note of the fee listed at the bottom of this website. It should also be pointed out that application forms are not accepted under any circumstances after 30-12-2018. For the late filing of the application forms, a fine of Rs. 2,000 / - per day will be charged against the colleges. The detailed timetable will be notified in due course. Determination of the eligibility of the candidates before the sending of NRs forwarding the applications of only eligible candidates. If any deviation is found, the college is punished with Rs. 5,000 / - per deviation according to the standards. The draft application (s) will be lodged in favor of the National Bank of Hyderabad, K.U. Branch (Code No. 262), Warangal. And Academic Section for the II Year or I semester exams of each course KU.